The general aim of the YEBO! project is to foster and develop the internationalization of doctoral studies in South Africa. Based on the needs identified by the project’s partners and on the definition of internationalization (promotion of international mobility, publishing articles, exchange of good practices, joint-supervisions, international network, etc. ), the Yebo! project has identified four specific objectives to work on. I. Improve the access to information on how to internationalize PhD studies. The creation of a sustainable and fully functional structure, the PhD portal, will ensure students, academic and administrative staff to have a constant access to information such as, but not limited to, funding opportunities, administrative procedures, mobility opportunities. Furthermore, we will progressively extend the possibility to upload information on the portal to all South African and European universities interested. II. 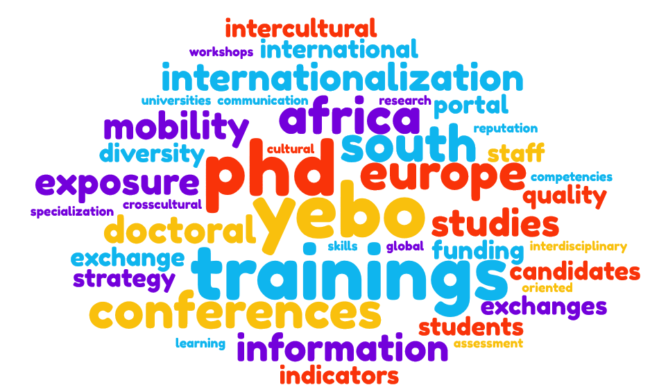 Promote the internationalization of PhD studies both in South Africa and in Europe. One conference will be organized in South Africa. It will increase the visibility of PhD studies, but also foster sustained and increased research network access. Both South African and European partners will benefit from the exposure and will be able to exchange ideas and network around subjects such as tools used internally to promote the internationalization of PhD studies, or sessions on « how and why to internationalize your PhD studies ». III. Increase the quantity of staff, both academic and administrative, and students, trained in the field of internationalization, as well as the quality of the training they receive. The training sessions will respond to the need of the South African partners to facilitate the training of their PhD supervisors, but also students. Thus developing the internationalization of PhD studies through mobility at home. Students are the best equipped to then promote these tools to other students. IV. Build the capacity of South African universities to assess and monitor their internationalization strategies for PhD studies. This need is answered by creating our own questionnaire based on the FRINDOC project to assess the internationalization rate of every institutions implicated in the project. South African universities will be able to analyze their data and decide on indicators to work on and improve during the lifetime of the project.Working on their own internationalization rate will also allow them to see if they need to implement or not a tool to help them map international activities in their institutions.